Five years have passed since the catastrophic terrorist attacks of September 11, 2001. Those attacks ushered in the war on terror. Since some high-ranking government officials and pundits are now referring to the war on terror as the "Long War" or "World War III," because its duration is not clear, now is an appropriate time to take a few steps back and examine the disturbing new vocabulary that has emerged from this conflict. One of the central insights of George Orwell's classic novel Nineteen Eighty-Four concerned the manipulative use of language, which he called "newspeak" and "doublethink," and which we now call "doublespeak" and "Orwellian." Orwell was alarmed by government propaganda and the seemingly rampant use of euphemisms and halftruths -- and he conveyed his discomfort with such tactics to generations of readers by using vivid examples in his novel. Despite our general awareness of the tactic, government officials routinely use doublespeak to expand, or at least maintain, their power. The purpose of this paper is not to criticize any particular policy initiative. Reasonable people can honestly disagree about what needs to be done to combat the terrorists who are bent on killing Americans. However, a conscientious discussion of our policy options must begin with a clear understanding of what our government is actually doing and what it is really proposing to do next. 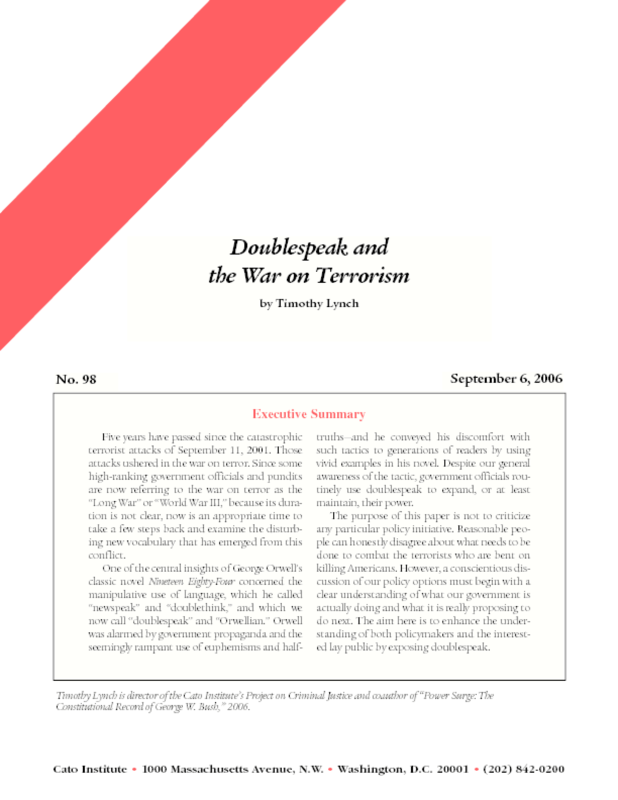 The aim here is to enhance the understanding of both policymakers and the interested lay public by exposing doublespeak. Copyright 2006 The Cato Institute. All rights reserved.